Home > Kits > Domotica "Home Automation"
Create your own domestic modular light control system. 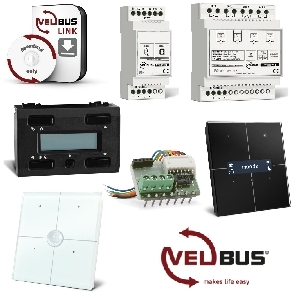 For use with optional plug-in timer module K8008 or plug-in slow-on/slow-off module K8029. Bus system holds up to five plug-in units. Optically insulated push button inputs. Can be controlled with open collector circuits (eg. 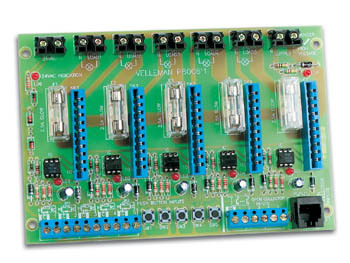 K8000 computer interface card, with IR remote control receiver K8050 or with K8023). Local control pushbuttons included. LED power and mains indicator. LED operation indicator for each channel. 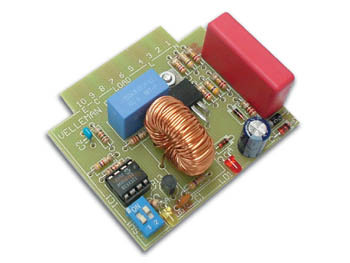 Low-voltage (24VAC) control circuit for extra safety. Each plug-in slot is fused. Includes 10 LED's for pushbutton illumination. Microprocessor controlled. Dual mode operation :* Slow on / Slow off dimmer with two independent and programmable delays. Dimming direction changes with each key press. Manual level control is possible. This mode also simulates a 'regular' dimmer. * Light is turned on at full power for a programmable time, after which it slowly fades to zero, also during a programmable time.